Parrots (Psittacidae) are one of two families within the order Psittaciformes, the other being the cockatoos (Cacatuidae). Lories belong to small to medium-sized parrots which mostly have an extremely colourful plumage. This group of parrots is especially known for their special diet: they mainly feed on nectar and pollen of flowers. To easily harvest the nectar their elongated tongue carries small erectile papillae on the tip which get soaked with nectar. Back in the bill the tongue is squeezed out at the roof of the mouth. Additionally to the nectar, lories also feed on soft, juicy fruits and some seeds. The Dusky Lory (Pseudeos fuscata) is distributed on New Guinea in Indonesia as well as on Papua New Guinea and the surrounding islands Yapen and Salawati. There it inhabits hill rain forests up to 2400 m, but can also be seen in suburban parks and even occasionally in savannas and plantations. This species is highly gregarious and sometimes forms roosts of several thousand birds. Like the other species of lories they mainly feed on nectar but also take pollen, coconut blossoms and fruits like mango. In the wild, the offspring of the Dusky Lory are reared in hollows of tall montane trees. Normally, two white eggs are laid between november and april, which are incubated for 24 days. After hatching, the nestling period is about 70 days before the young fledge. 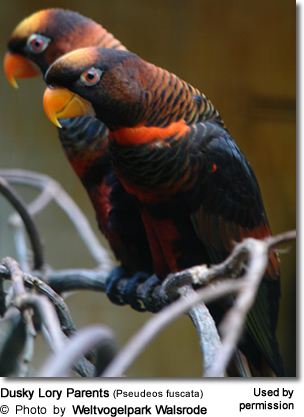 On the Red List of Threatened Species this lory is considered as “least concern”. In Germany the Dusky Lory only can be found in a few zoological institutions and can be distinguished from many other extremely colourful species by its reddish-brown coloured feathers. The creamy to white coloured lower back and rump, which gave the species its name in the German-speaking part, is covered by the wings most of the time and can only be seen by patient visitors while the bird is flying or during courtship. Weltvogelpark Walsrode houses a breeding pair of this lory species on show in an enclosure of the “Lori Atrium”. The breeding pair is extremely territorial and often vigorously flap their wings, whereat the white rump mentioned above can be seen. The nest box is vehemently defended against intruders. Regularly, the female lays two eggs in its nesting box. Although the eggs have a high fertility rate, the parents did not manage to rear the young by themselves so far – either the juveniles vanished shortly after hatching or they were found dead in or outside the nesting box. Therefore, it was decided in 2011 to rear young of this species by hand. In total three chicks of the Dusky Lory were reared by hand during last summer. 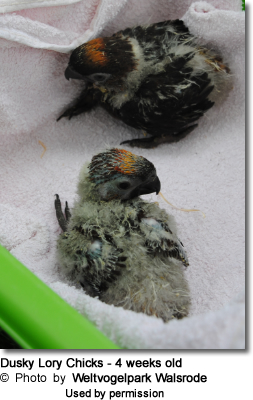 The first two young which hatched at the end of May in the nesting box of the parents were taken to the hand rearing section at the age of approximately two days. As in all lory species the young are very small, the pink-coloured skin is covered with white fluffy down feathers and their eyes are still closed. Directly after taking the young away from their nest box they were placed in heated rearing boxes and during the first six days were kept at a temperature of 37,1 °C and an air humidity of 65 %. Both chicks still had food remains from the first feedings of their parents in their crop, so that during the first hours in the hand rearing section only fluids (Ringer’s solution) and lactobacilli were given to the young. At arrival the small lories weighed just about 5 g.
During the first days the juveniles were fed 5 to 6 times per day with a 1 : 1 mixture of a powder especially developed for lories as well as the powder “A19 High Energy” to rear parrots. Additionally, lactobacilli and dextrose were added to the mush. 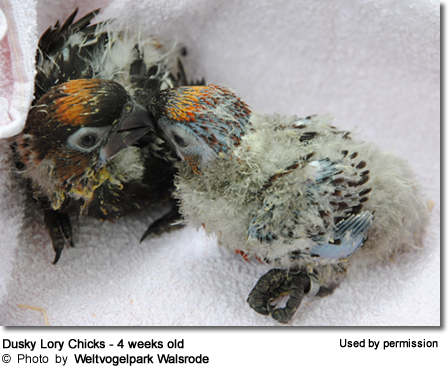 Within one week the chicks increased in weight from 5 to 14,5 g. The number of feedings was adapted to 4 – 5 times per day, depending on how fast the young digested the food. From the 6th day onwards the temperature of the rearing box was set to 36,9 °C and in the following days the temperature was slightly reduced step by step by 0,1 °C. Thereby the condition of the young was always controlled by the experienced animal keepers in order to be able to adapt the temperature to the well-being of the juveniles. Given that the juveniles were developing very well and steadily increased in weight, they were fed three times a day from mid-June onwards. At that stage, the feeding mixture was mixed 2 : 1 from lory powder and A19 High Energy. At the age of three weeks the young lories already weighed around 50 g and, additionally to the daily feedings, already fed by themselves from a feeding dish in their rearing cage. After six weeks they had a weight of around 110 g and after around 70 days the young fledged. The next clutch of the breeding pair was taken away from the nesting box already after a short incubation phase and was transferred to an incubator. The eggs were subsequently incubated at a temperature of 37,2 °C and an air humidity of 55 %. One juvenile successfully hatched, the other egg was not fertilised. The newly hatched chick was fed for the first time during the first 24 hours to make sure that the small young directly got enough energy to start its life. Following the success of hand rearing the first young, there were no problems in the course of the growing up of this juvenile. By now all young are already fledged and feeding by themselves for a long time, so that they are housed in the enclosures of the Lori-Atrium besides their parents and other lory species. 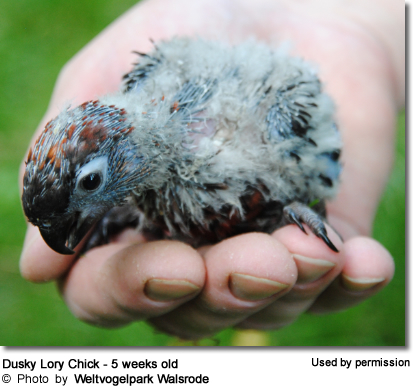 In 2012 – the fifty year anniversary of Weltvogelpark Walsrode – we now are looking forward to several more juveniles during the breeding season! del Hoyo, J., Elliott, A. & Sargatal, J. eds (1997). Handbook of the Birds of the World. Volume 4. Sandgrouse to Cuckoos. Lynx Edicions, Barcelona.